In a bowl, mix together couscous and hot water (make sure the water is HOT, if you have an electric kettle boil water in it). Let it sit for 5 minutes. Then mix again with a fork. In another bowl, whip EVOO and lemon juice together. 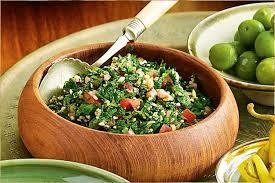 Pick a bowl that you want to serve the tabouli in. Mix parsley, tomatoes, couscous (now soft), salt and pepper. Drizzle with the EVOO/Lemon Juice Dressing. Mix and Enjoy!